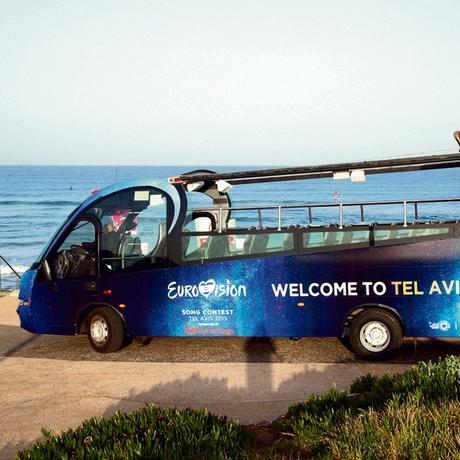 Yediot is reporting that the City of Tel Aviv will be operating two bus lines through the city to bring people to the Eurovision events on May 17 and May 18 - that is a Friday and Shabbos. The two bus lines will operate on pre-determined routes and schedules and will be free of charge. The purpose of these lines is to bring tourists in town for the Eurovision competition to the events, but Israelis will be allowed to use the lines as well. The city will be putting 600,000nis into these lines, while the State will not be funding any of it. According to Yediot it also seems that locals are upset about this - besides for the frum people who are, or will be, upset about this city-sponsored public transportation on Shabbos, seculars are upset that this is only being done for the Eurovision, for international tourists, but not for them on a normal weekend and on an average normal weekend, if they want to cross town to visit someone or go for entertainment they have to spend a lot of money on taxis. It seems to me that if they hire non-Jewish drivers, there should be little halachic problem with this, but the appearance will be the big issue. Any opposition to this will surely only happen at the last minute, as that is the modus operandi of the frum parties, when it is too late to be effective, unless they insist on brute force. Either way, they'll turn it into an issue in a way that will magnify the snowball effect. Whether this happens in the end or not, this will raise the demand for public transportation on Shabbos in cities like Tel Aviv.